http://www.valroofing.com/wp-content/uploads/2013/03/gutter_leaf_guard-1.jpg 400 600 Valley Roofing http://www.valroofing.com/wp-content/uploads/2013/03/Valley_Roofing_Logo.png Valley Roofing2018-08-08 09:04:002018-08-08 09:38:30How Gutter Guards Simplify Home Maintenance. http://www.valroofing.com/wp-content/uploads/2013/03/gutter_leaf_guard.jpg 400 600 James Groff http://www.valroofing.com/wp-content/uploads/2013/03/Valley_Roofing_Logo.png James Groff2018-05-07 12:01:342018-05-07 12:07:21Are Gutter Guards Worth The Investment? http://www.valroofing.com/wp-content/uploads/2016/11/g2.jpg 598 900 James Groff http://www.valroofing.com/wp-content/uploads/2013/03/Valley_Roofing_Logo.png James Groff2018-04-21 09:00:502017-07-21 09:10:38Add Gutter Cleaning To Your Spring Cleaning List. The Top 3 Reasons To Add Gutter Guards To Your Home. Gutter guards prevent the accumulation of organic matter in your gutters. They play a pivotal role in keeping gutters free flowing and dry which in turn keeps your home’s facade from deteriorating. http://www.valroofing.com/wp-content/uploads/2014/10/Blog-Gutters-2-e1530126647747.jpg 1847 2311 Anson Martin http://www.valroofing.com/wp-content/uploads/2013/03/Valley_Roofing_Logo.png Anson Martin2018-04-07 11:36:482018-06-27 15:13:59The Top 3 Reasons To Add Gutter Guards To Your Home. Gutter Installation Gone Wrong: What Can Happen. Properly installed gutters are critical to keeping your home in tip-top shape. http://www.valroofing.com/wp-content/uploads/2014/04/W8A8713.jpg 3814 5720 Joseph Showalter http://www.valroofing.com/wp-content/uploads/2013/03/Valley_Roofing_Logo.png Joseph Showalter2018-03-07 11:21:402018-05-07 11:35:37Gutter Installation Gone Wrong: What Can Happen. Protect Your Home From Ice Dams. Ice dams are the result of heat escaping your home in the winter, melting the snow and ice on your roof and refreezing that water along your roof’s overhang. This might sound like a minor issue, but the safety implications shouldn’t be neglected. http://www.valroofing.com/wp-content/uploads/2013/03/TruSlate_Greystone_House-cropped.jpg 600 800 Anson Martin http://www.valroofing.com/wp-content/uploads/2013/03/Valley_Roofing_Logo.png Anson Martin2018-01-21 08:38:562018-01-22 10:15:12Protect Your Home From Ice Dams. Gutter Cleaning Protects Your Home’s Foundation. Gutter cleaning is one of the quickest, simplest, and easiest way to preserve the foundation of your home. Clogged gutters can backup the flow of water from your home, leaking down the siding and saturating the support systems of your home. http://www.valroofing.com/wp-content/uploads/2017/04/guttersthumb.jpg 283 350 Anson Martin http://www.valroofing.com/wp-content/uploads/2013/03/Valley_Roofing_Logo.png Anson Martin2017-10-19 11:54:222017-07-19 12:04:04Gutter Cleaning Protects Your Home's Foundation. Sit Back And Let Us Do The Dirty Work. In time debris can build up in your gutter systems, keeping them from functioning properly and causing costly damage to your home. Milder temperatures and seasonal changes make spring and fall great times to clean out your gutters. However, the task can easily go undone for the danger of climbing to reach the gutters and the dirty work of mucking them out. Stuarts Draft Gutter Cleaning Is A Call Away! If you are a do-it-yourself type and want tips for gutter cleaning, we are salute you. If you are ready for someone else to manage the chore, Valley Roofing is happy to help. We offer gutter cleaning and regular maintenance so that you don’t have to. 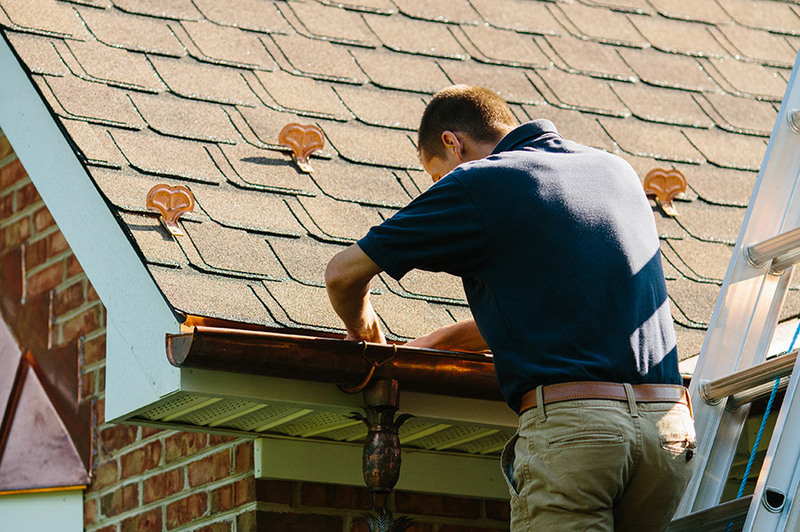 Our crews will flush out your gutters, removing the debris and identifying any weakened sections that can be shored up to serve your home more efficiently. You just sit back and relax! Gutter Guards Take The Mess Out Of Cleaning Gutters. If you want to avoid the hassle of gutter cleaning altogether, gutter guards may be the solution for you. Stuarts Draft homes and businesses with gutter guards benefit from the peace of mind that water is flowing away from the foundation of the structure, eliminating the damage from runoff that can happen when gutters are clogged. Gutter guards securely fit over your gutters, using a grate system to keep debris out and let water in. Take a look in our gallery at the subtle aesthetic addition to a home gutter system. Valley Roofing Provides Affordable Roofing and Gutter Solutions In Stuarts Draft. Our roofing services include gutter cleaning and the installation of gutter guards, as well as roofing repairs and maintenance. We provide on-site free estimates to give you options at a range of price points. We accept four payment options for your convenience. Call (540) 820-2705 Today For A Free Estimate For Gutter Cleaning In Stuarts Draft! Staunton Gutter Guards Eliminate Debris That Could Block Your Water Flow. Whether on a Staunton home or business, a properly functioning roof relies on clean and functional gutters. Keeping debris from clogging up your gutters can be a dangerous and messy job that requires attention a few times a year. There’s a better way! Staunton gutter guards offer a solution to eliminate the clog. Cover your gutters for a seamless look from the street. Gutter guards effectively keep unwanted debris from finding a way into the gutters. Check out how well gutter guards blend into a home’s aesthetic in our gallery. Easily Maintain Gutters On Staunton Homes And Businesses. Spring and fall are prime times for gutter cleaning. This can be a scary event involving ladders, buckets, and balancing while digging out decaying debris and sometimes even small rodents and snakes. We offer a checklist of gutter cleaning solutions for those who enjoy a good do-it-yourself home project and have the desire to maintain their gutters for proper function. For others, roofing repairs or maintenance means a well-placed call to local experts. Valley Roofing offers Staunton safe and thorough gutter cleaning without the fear of getting dirty or hurt. Valley Roofing Offers Free Estimates For Gutter Guards And All Your Roofing Needs. Give Valley Roofing a call. We schedule an on-site visit to offer you a free estimate for the services you require. Our team of experts identifies a range of price points for your roofing solution. We are available to answer your questions. We offer four convenient payment options to provide you with choices you can feel good about. Watch or read our testimonials for an idea of what to expect when you work with Valley Roofing for the perfect fit. Call (540) 820-2705 Today For A Free Estimate For Staunton Gutter Guards!